The Community Carbon Challenge project kicked off on Monday 15th of June 2009. NHT in partnership with TEAS, the Energy Advisory Service (Western Isles) are seeking to eradicate fuel poverty and encourage a reduction in carbon and energy consumption in North Harris. 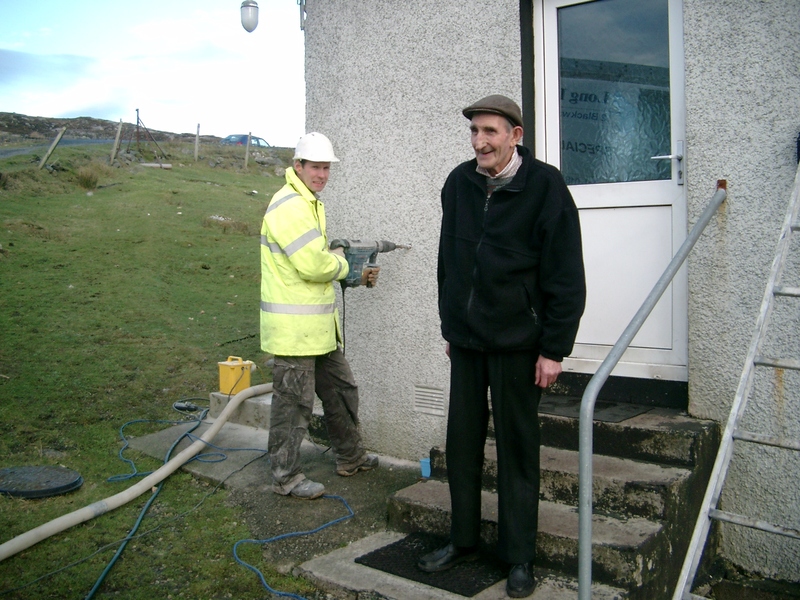 It is providing extensive help to houses within the community of North Harris to lower fuel bills, by installing energy saving measures such as roof and cavity wall insulation. Public awareness of the project was raised with regular community newsletter articles, a mailshot and a drop-in session at the Tarbert Community Centre. The majority of survey work was completed at the start of 2010. Taigh Blath were then busy installing loft insulation. The 100 houses budgeted for, were completed, during the second and final year of the project. After one of the longest spells of freezing conditions at the start of 2010, householders started to notice the benefit of good insulation. One resident told us that she’d never had snow lying on her roof for days on end- it always melted. Now that the loft is insulated, the roof is kept cold for the first time. Long Island Insulation fitted cavity wall insulation as part of the project. Here’s one of the residents having his fitted. Hopefully he’ll have felt the difference during the cold spell. In addition to insulation being fitted, Home Energy Packs were assembled for delivery to all households in North Harris. The first 100 of these were issued before Christmas 2009 to the more remote settlements. A further 120 packs were delivered by staff and Directors of the Trust and Trading Company throughout March 2010. The last batch 0f 50 were issued throughout October 2010, ensuring blanket coverage. November 2009 saw the Ecodrama group visit Tarbert from Glasgow. They tour the country running workshops and performing plays that highlight global warming and renewable technologies. Nearly 100 primary and secondary school pupils attended the two workshops and play at Sir E Scott school. After the event, NHT and TEAS sponsored a competition to design an eco gadget. Prizes were awarded at the end of term assembly. At the start of 2010 CCC work was been pulled forward to reduce confusion with another insulation scheme (HIS) that was operating throughout Lewis and Harris. This Scottish Executive-funded scheme was similar – but for most, it involved a financial contribution from the household. The good news for North Harris is that between the two schemes every household should have had the opportunity to reduce their fuel bills and have a more comfortable home. At the start of 2011, the project came to a close. The last houses were completed and reports for the funding partners drawn up. Thanks must go to The Climate Challenge Fund, Comhairle nan Eilean Siar and the utility companies including SSE and E-on, that have made this work possible. A number of Local Authority run schemes have since come along.